The Master of Darkness proves that "crime does not pay" in chilling pulp thrillers by Walter B. Gibson writing as "Maxwell Grant." First, a deadly Oriental poison is employed to dominate the world gold market! Will Lamont Cranston fall victim to "The Creeping Death"? Then, a s�ance, a vanishing blonde, and a nymph-like creature lure The Shadow along a trail to hidden treasure! 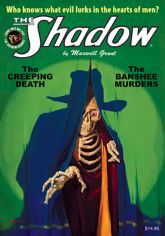 Can The Shadow pierce the occult shroud in one of his most baffling cases? This instant collector's item leads off with one of George Rozen's most haunting paintings (reproduced directly from the original art), and also showcases the original interior illustrations by Tom Lovell and Paul Orban, as well as historical commentary by Will Murray.